Seashore Hideaway in Newbiggin-by-the-Sea, Northumberland sleeps 4 people. Seashore Hideaway in Newbiggin-by-the-Sea has a private hot tub set in the rear garden; with dressing gowns and slippers provided, this comfortable, semi-detached holiday home is only 850 yards from the seafront, with its glorious sweeping sandy bay in this small and friendly seaside village. An ideal base from which to explore the many delights of this friendly and unspoilt county, this house is situated to the rear of a residential area, but offers privacy without being overlooked with the fields behind. Newbiggin-by-the-Sea used to be a thriving fishing village, but now only a few coble boats fish from the shore. Situated along the tops of the cliffs is an exceptional 18-hole golf course and, by prior arrangement with the owner, guests can receive a fantastic 50% discount. The beach sweeps around the bay where ’The Couple’ offshore statues stand in the bay, a great landmark for the east coast. The village has a cliff top golf course, and the owner can arrange a discount should you wish to partake in a round of golf. The far end of the bay houses the Maritime Centre. where you can see the original lifeboat in the little museum and enjoy the views while relaxing in the café on-site. The promenade goes a mile along from each end of the village and is a lovely gentle stroll. Mid-way along the promenade is a popular ice cream café, which has been there since the 1930s, where they serve a family recipe ice cream. Children love to explore the rock pools, and the area is suitable for all age groups. Nearby Woodhorn Museum regularly holds exhibitions and children’s activities, and is home to genealogy records, and is situated next to the QE2 Park. Nearby Cresswell and Druridge Bay have miles of unspoilt golden sands with a bird sanctuary, and is the start of the Heritage Coastline going all the way up the coast past Holy Island. Amble, 13 miles, is popular and has a super Sunday market and fish restaurants. A day trip to Kielder Water Park and Forest is a lovely change from the coast and is approximately 50 miles away. Hadrian’s Wall is 45 miles if you are interested in Roman history, with museums and lovely scenery. After exploring, head back to Seashore Hideaway for a relaxing dip in the hot tub and plan your next day’s adventures. The beach is ½ mile from Seashore Hideaway in Newbiggin-by-the-Sea. With the shop 525 yards, the pub is ½ mile and the restaurant is 1 mile from Seashore Hideaway. Dining room/conservatory: With wooden floor and French doors leading to hot tub. Kitchen: With electric cooker, slow cooker, microwave, fridge and washing machine. Bedroom 2: With twin beds and 22 Freeview TV. Gas central heating, electricity, bed linen, towels and Wi-Fi included. Travel cot and highchair. Outhouse with tumble dryer. Welcome pack. 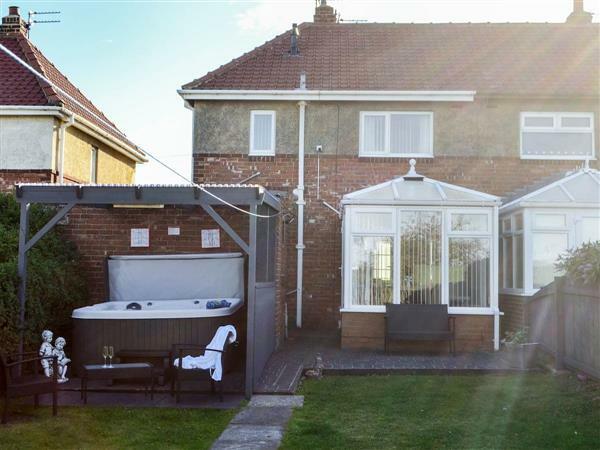 Enclosed lawned garden with sitting-out area and garden furniture. Hot tub for 4 (private). Private parking for 2 cars. No smoking. Holidays at Seashore Hideaway run from Friday to Friday. Pets allowed at Seashore Hideaway. For a better idea of where Seashore Hideaway is, you can see Seashore Hideaway on the map below. Seashore Hideaway is in Northumberland; should you be on the lookout for a special offer, you can find all the special offers in Northumberland. It's always worth checking to see what is on offer at the moment. Do you want to holiday near Seashore Hideaway (UK10028), you can see other cottages within 25 miles of Seashore Hideaway; have a look to find your perfect holiday location.